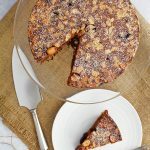 Simple Cherry Chocolate Cake has a delicious crusty almond topping underneath which lies a moist chocolate sponge spiked with fresh cherries! Grease and flour a 20cm spring form baking tin. Sprinkle on the flaked almonds. Cream together the butter/spread and soft brown sugar until pale and fluffy. (Use an electric whisk or stand mixer). Beat in the egg a little at a time until fully incorporated. Sieve the flour, baking powder and cocoa powder together in a bowl. Gradually fold in the flour mixture, a spoonful at a time with a large metal spoon (moving in a figure of 8) until fully mixed in. Then fold in the cherry halves. Spoon the mixture into the cake tin and place on the middle shelf of oven. Bake for 30 - 35 minutes until an inserted skewer comes out clean or cake springs back to the touch. Turn cake out onto a wire rack to cool. Once cool dust with icing sugar. Serves 8 – 10 and keeps for 3 days. Feel free to up the chocolate content with a chopped 100g bar of dark chocolate, just fold in along with the cherries.